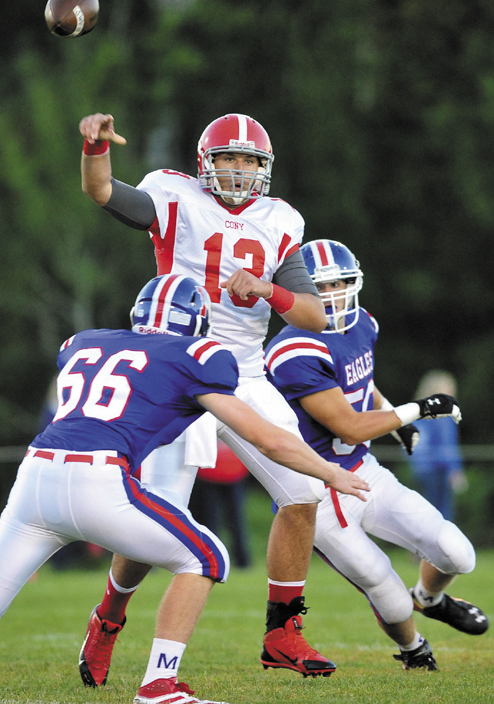 Cony quarterback Ben Lucas will graduate as one of the most prolific passers in Maine history. He’s thrown for 6,501 yards and 72 touchdowns in his career. Lucas has thrown for 2,204 yards and 24 touchdowns this season. He has six interceptions this season, and 27 for his career. Ben Lucas, like most senior athletes, isn’t ready for the end. The hulking Cony High School quarterback knows it’s coming, like a rolling wave about to crash. When one of the best quarterbacks in Cony history plays his final game sometime this fall, the 6-foot-4, 227-pound Lucas will reflect on a legacy he’s worked hard to create and then decide his collegiate future he’s worked even harder to plan. But that’s for some other day, at some other time. Today, Lucas and his high-powered Rams (5-2) will prepare for rival Gardiner (0-7) before they embark on a playoff odyssey they hope ends with a Gold Ball at Alfond Stadium in Orono later next month. Lucas will graduate as one of the most prolific passers in Maine history. He’s thrown for 6,501 yards and 72 touchdowns in his career. Lucas has thrown for 2,204 yards and 24 touchdowns this season. He has six interceptions this season, and 27 for his career. Former Winthrop quarterback Lee St. Hilaire is believed to hold the state record with 8,019 passing yards and 84 touchdowns. St. Hilaire, a four-year starter, played in 43 games — going 36-7. Lucas will play in his 28th game Friday night at Alumni Field. The Rams are 15-12 in games he’s started, including 13-5 the last two seasons. Not bad, considering the 17-year-old Lucas didn’t take his first snap as a quarterback until eighth grade. Lucas started playing football in second grade, and he primarily played wide receiver/running back. Things changed in eighth grade. Starting quarterback Jonathan Saban suffered an injury during the season opener and coaches called on Lucas to finish the game. The following year, as a freshman, Lucas caught the attention of Vachon and the rest of the Cony coaching staff. Lucas struggled a bit his sophomore season. Although he completed 110 of his 221 passes for 1,539 yards and 16 touchdowns, Lucas struggled to read defenses, go through his progressions and find the open receiver. The Rams finished 2-7. But when? When would the transformation from good to great occur? Lucas credited the following offseason, particularly pointing to the difficult workouts with his brother, Nick, as key to his development. Nick Lucas, 20, graduated from Cony in 2011 and is a split end for Endicott College in Beverly, Mass. The brothers train with each other in the summer. “We would go find the steepest hills in Augusta, the one near the skate park, and go run them,” Nick Lucas said. “Then we’d go up to the football field on Capital Park, right by the YMCA. I’d run some routes and he’d throw me the ball. We’d go red zone, slants, hitches, fades. I was hard on him. In July, we’d do this two or three times a week. Ben Lucas enjoyed a breakout season his junior year. He threw for a school record 2,758 yards and 32 touchdowns. He completed 204 of his 355 passes and led the Rams to their first conference championship game in 20 years. Cony fell to Lawrence in the PTC A final, but Lucas established himself as one of the premier passers in the state. Lucas has completed 136 of 226 passes for 2,204 yards and 24 touchdowns this season. He’s thrown just six interceptions. The Rams are vying for the No. 2 seed, which would earn them a bye into the PTC B semifinals. Lucas hopes to decide on his collegiate plans sometime after the season ends. He took an official recruiting visit to the University of Maine last weekend and met with coach Jack Cosgrove. He’s looked at Holy Cross, Stonehill and Bentley. Future visits are planned for Wagner College (Staten Island, N.Y.), Bryant University (Smithfield, R.I.) and Sacred Heart (Fairfield, Conn.).